suemabberley	Sue's Musings	badger, dahlias, hedges, overwinter, tidy, tulips, untidy, winter garden	Comments Off on There’s tidy! 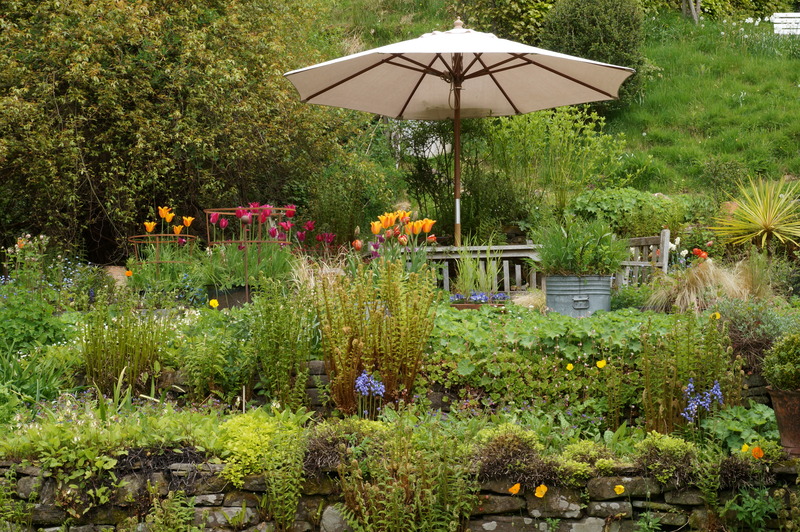 “There’s tidy” around here in Wales means something that has got someone’s seal of approval, for example, ‘there’s a tidy-sized marrow you’ve grown there boyo’…but in this article I’m using the word in it’s more usual sense of neat or organised. 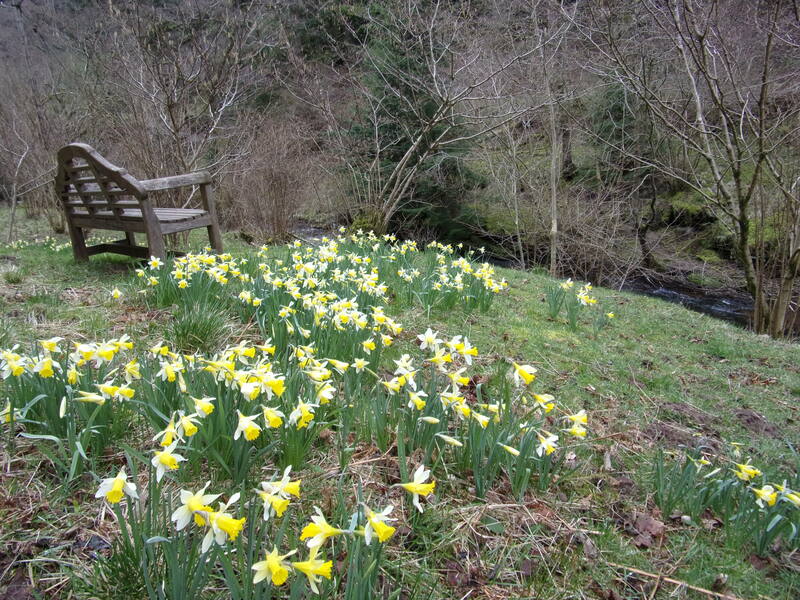 – or cutting by hand with my trusty Jakoti shears (yes really – the smaller areas) – are necessary to reduce the fertility and also enable us to enjoy the fresh Spring growth particularly is Spring bulbs are naturalised. But I think we can be too tidy in our gardens. In my tidier days I used to think that it was a great shame that people didn’t get around to picking their apples and left them on the tree. I have a friend whose children wouldn’t eat them because they had bugs in them. 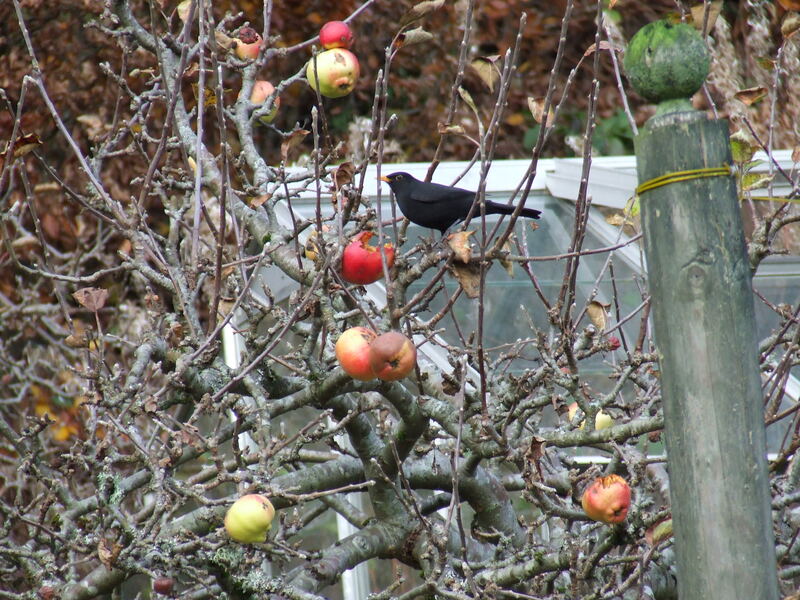 But of course, blackbirds in particular love apples at this time of year. Our Tom Putt doesn’t keep well and this year we had a big crop and so we left a couple of handfuls on the trees and the blackbirds are happily helping themselves – they don’t seem to mind the bugs. My sister has a lovely but quite small garden. 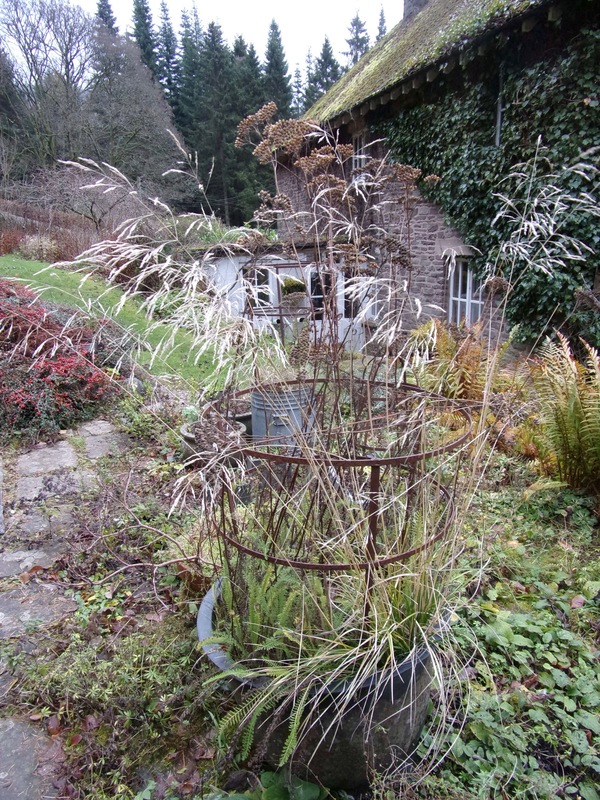 A pampas grass has rather outgrown its allotted space and slowly but surely is gradually making its way to Nant-y-Bedd. 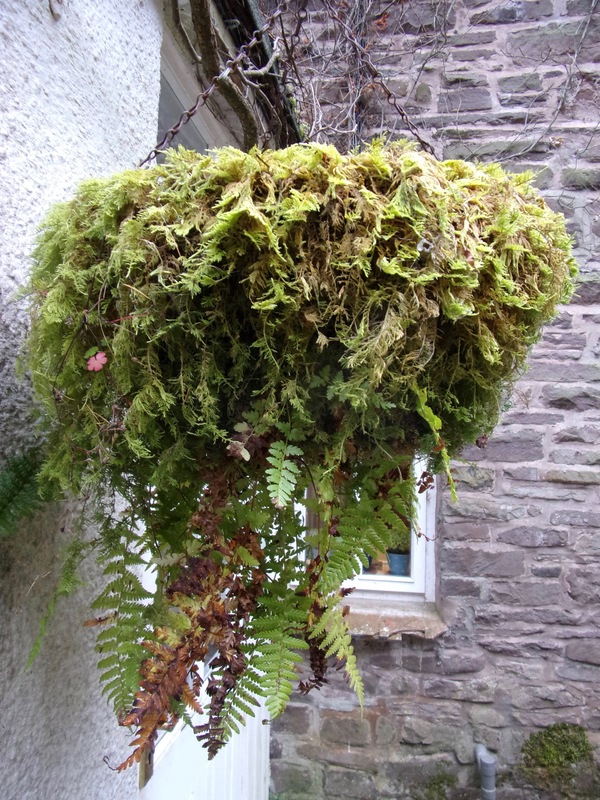 The final ‘mother plant’ was due to be evicted this Autumn. 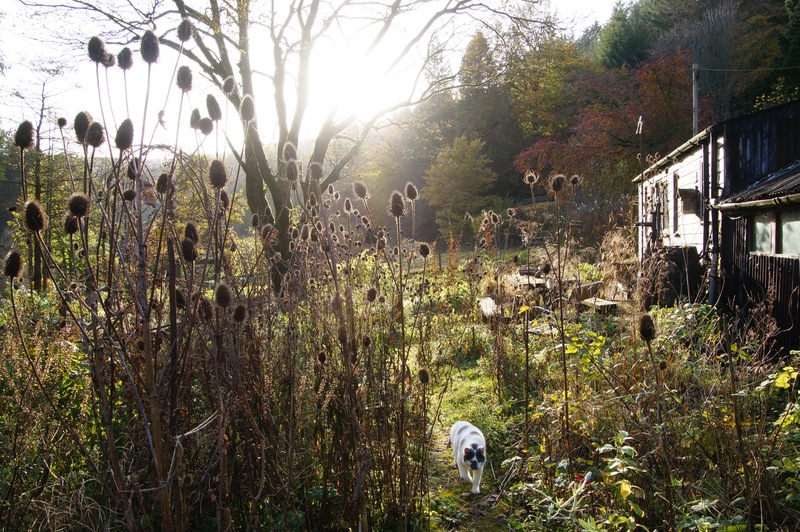 When sister, having cut off the magnificent plumes, parted the vegetation to attack it with her spade she found …a hedgehog happily snuggled away for its winter hibernation, so the spade went back into the shed for another go in the late Spring. I wonder if I could persuade her to let me re-home the hedgehog along with its pampas grass winter home? 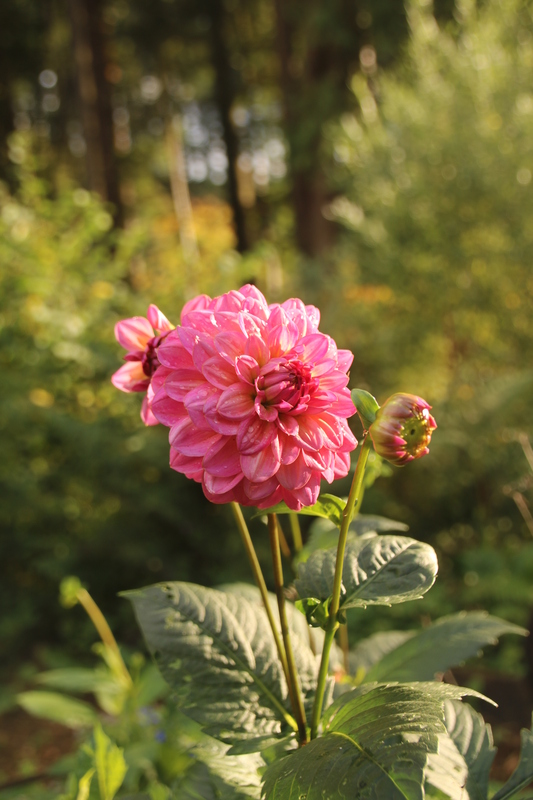 But we do feel the need to ‘tidy’ the dahlias – nothing more depressing in November than a bed of frost-blackened former lovelies. 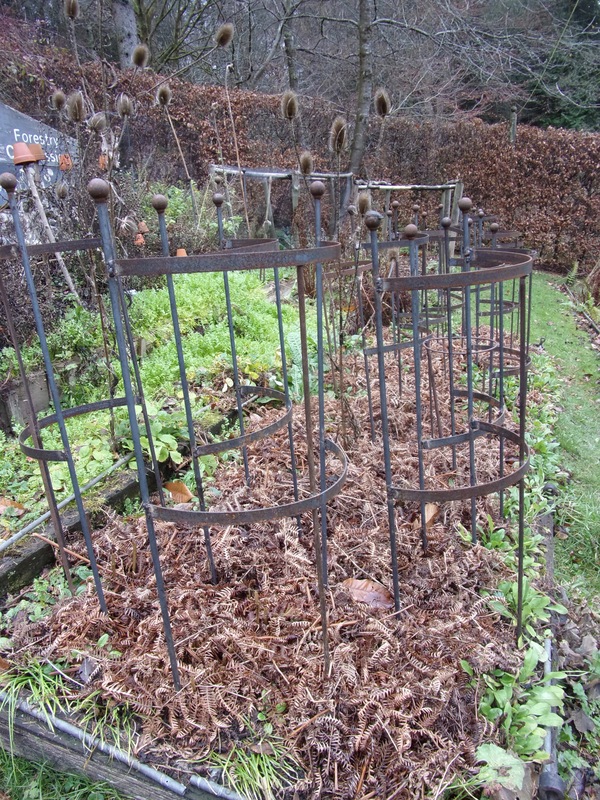 So, once they have been frosted, we cut them down now and mulch with bracken. We have very free draining sandy soil, so I guess that is how we get away with this method of over-wintering. 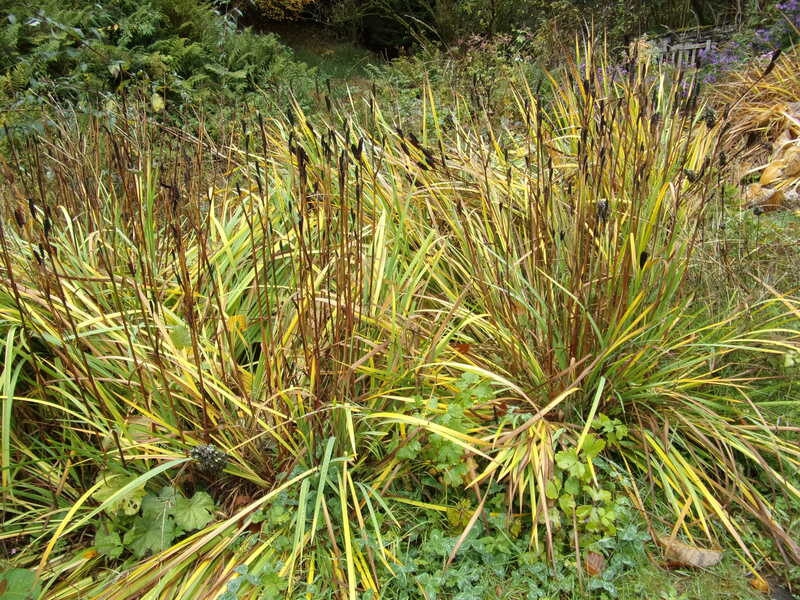 In heavier soils gardeners have the labour-intensive task of lifting, storing frost free and replanting in the Spring. Ours survived the ravages of the winter of 2017/18 without any problem. We do need to remember to remove the bracken as soon as any green shoots appear in the Spring because the mulch is perfect slug habitat. We don’t weed too enthusiastically here either, as visitors will know, especially at this time of year. 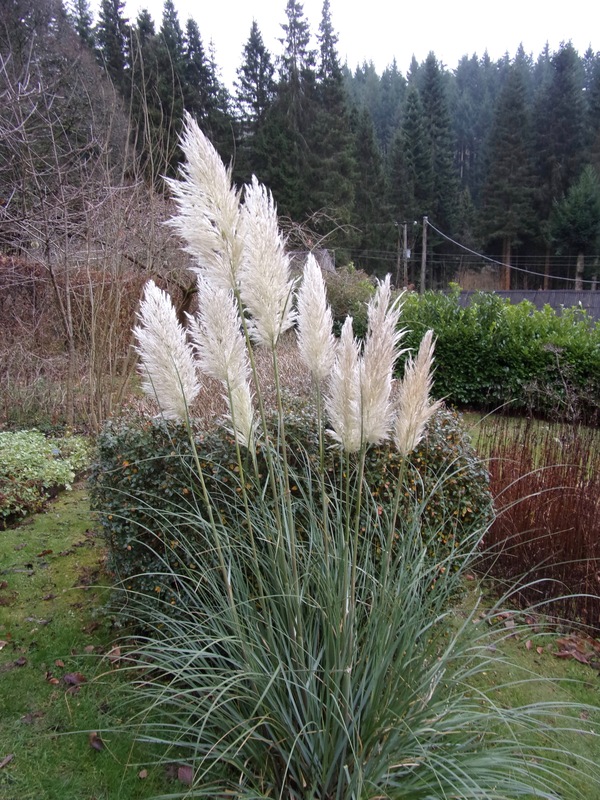 Bare soils in the winter mean that nutrients get leached out of the soil by the winter rains. 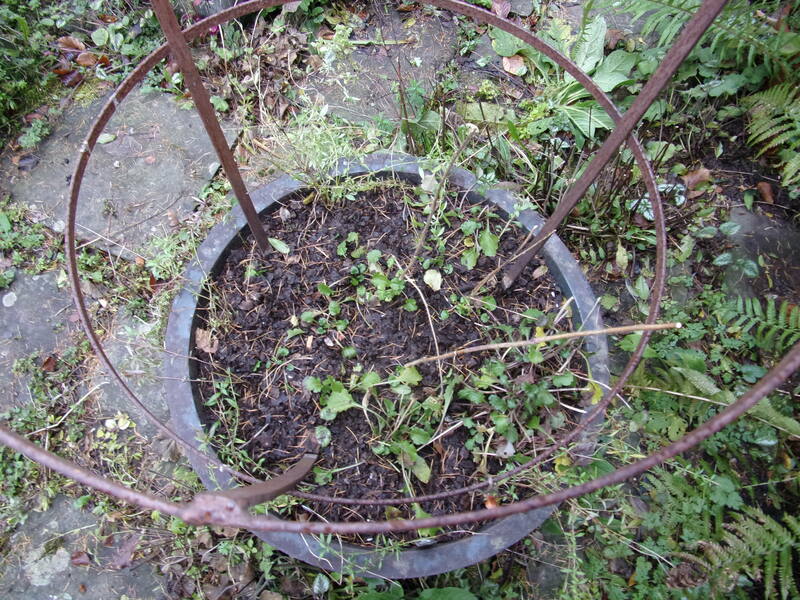 A covering of weeds is preferable in my view to bare soil. Self-seeding foxgloves, aquilegias’ and sweet rocket, for example, are left in the veg beds to be transplanted in the Spring to where we can enjoy them flowering. 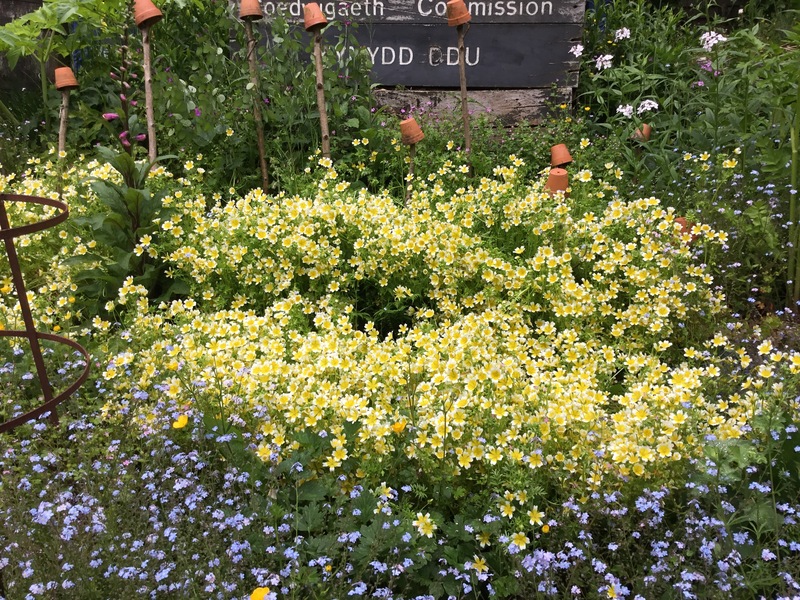 Hairy Bittercress and Chickweed are allowed to seed and provide winter and early Spring salads – join one of Liz Knight’s Foraging Days here to find out more about delicious weeds. 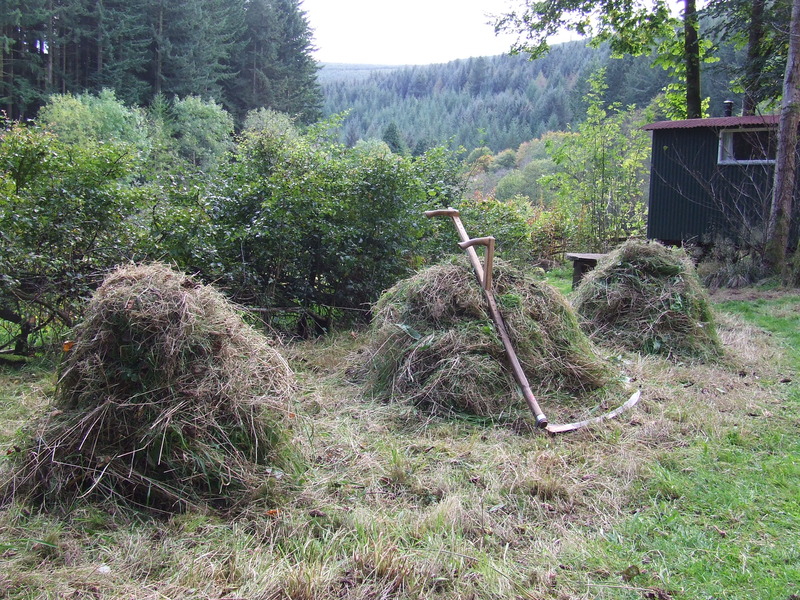 Annual grasses do get weeded out and composted before they can set seed. I’ve discovered a particularly good winter ground cover completely by accident – Limanthes douglasii (poached egg plant). It is a fantastic early flower for our pollinator friends, it stays a lovely fresh green all winter and it does a great job of supressing other weeds and locking in nutrients and self-seeds prolifically. Bargain! 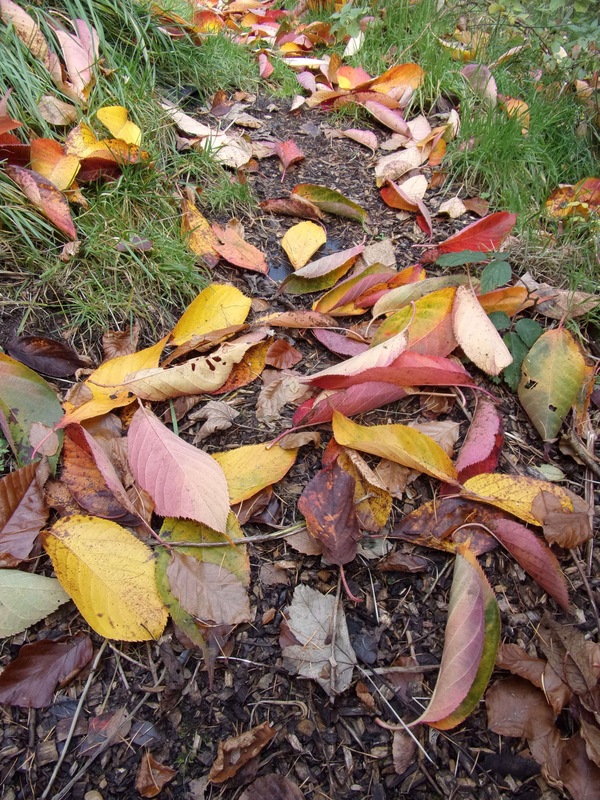 We do rake up leaves in the Autumn and store them in open leaf bins for 2 years to make a lovely friable leafmould. They do it all by themselves with no further intervention from the gardener. 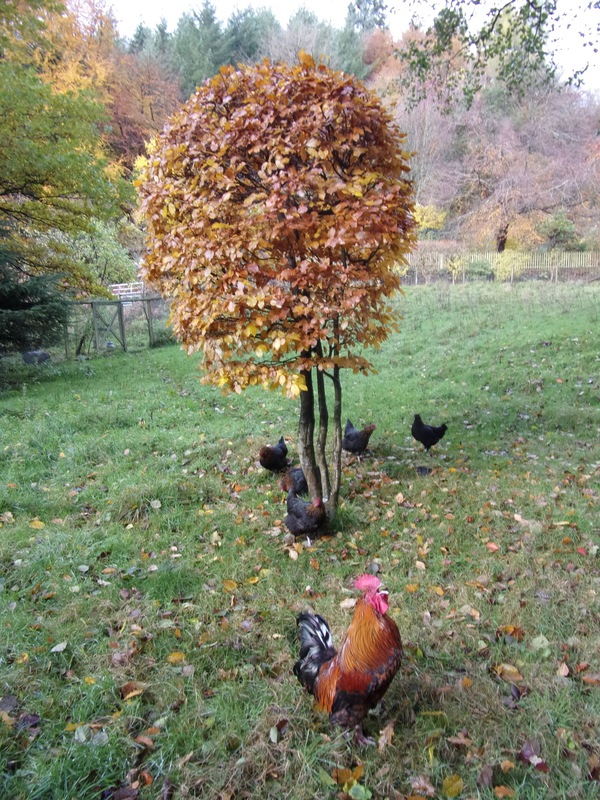 Speaking to a fellow gardener recently about my joy of raking Autumn leaves, I was surprised when she said she didn’t bother, implying “what’s the point?” I realised that she had only a few apple trees in her highly productive walled kitchen garden – so fair enough. We, on the other hand are not exactly short of trees – the raw material for such a natural and bounteous resource. 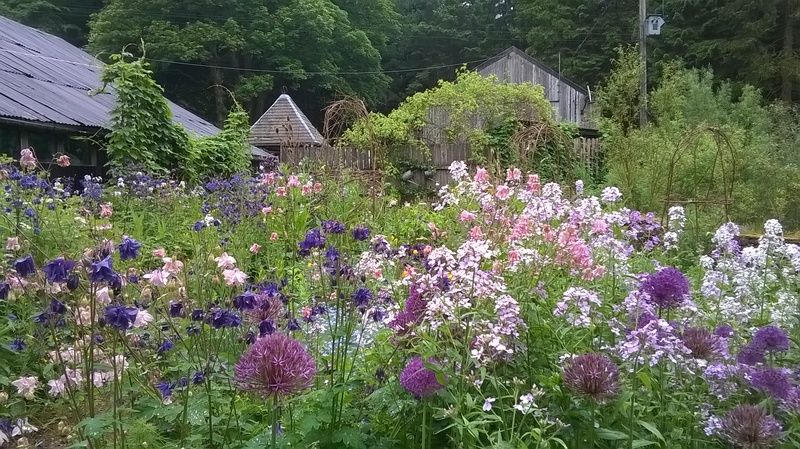 Some of the flower beds in the cottage garden don’t get too much tidying this time of year though. We do like to leave some of the vegetation and seed-heads to give some interest for us to enjoy through the winter whilst providing snugly-up habitat and food for wild winter visitors. They are allowed to stay until they get bashed down by whatever the winter weather throws at them and then cut down and put on the compost heap. We’ve tidied up the pots of summer flowering things and some are now in the greenhouse for their protection – for example lavender. I have discovered over the years that lavender does not like over-wintering at 1200 feet in a high rainfall area. Not surprising really for a plant that would much prefer to be growing in the sun-soaked Med rather than rain-soaked Wales. Other pots go into the greenhouse as much for the protection of the pots as what’s in them. 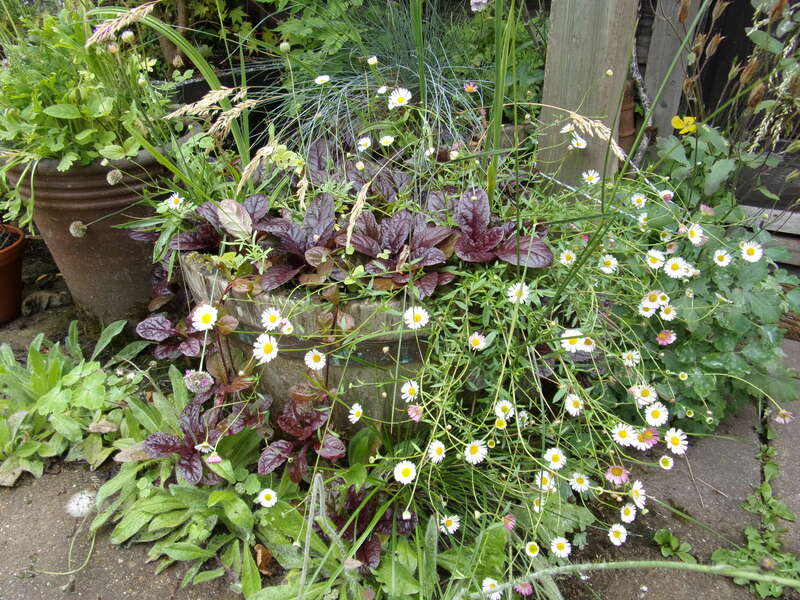 I have killed off many terracotta pots over the years – even the ones that are supposed to be frost-proof. So, we have fewer pots left outside for the Winter but tougher ones – many recycled from other uses such as galvanised water tanks or washing coppers. We are planting most of our Spring bulbs in pots this year. More time consuming, but hopefully it will confuse and delay our voracious local badger(s) who seem amazingly partial to a tulip bulb or sixty or failing that any hyacinths that might be about. Fortunately, they don’t go for naturalised snowdrops or daffodils and they tend to spit out any alliums that have the misfortune to be collateral damage. 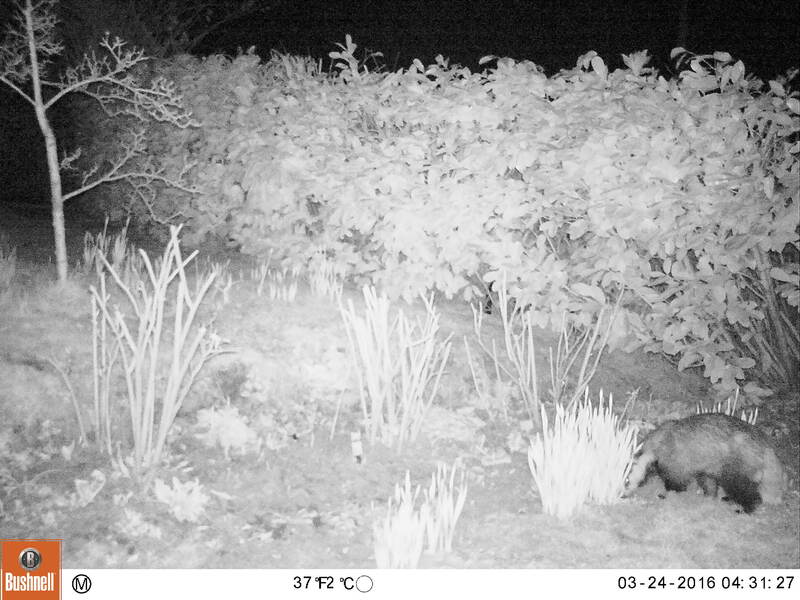 Their noses are unbelievable, we’ve tried coating them in most things smelly and covering them with wire mesh – the bulbs not the badgers noses! – but nothing works. Iris reticulata in a ferny mossy hanging basket 6 foot off the ground in a shady spot – so we get to enjoy the ferns and mosses from the kitchen window over the winter and surely no badger could reach those? 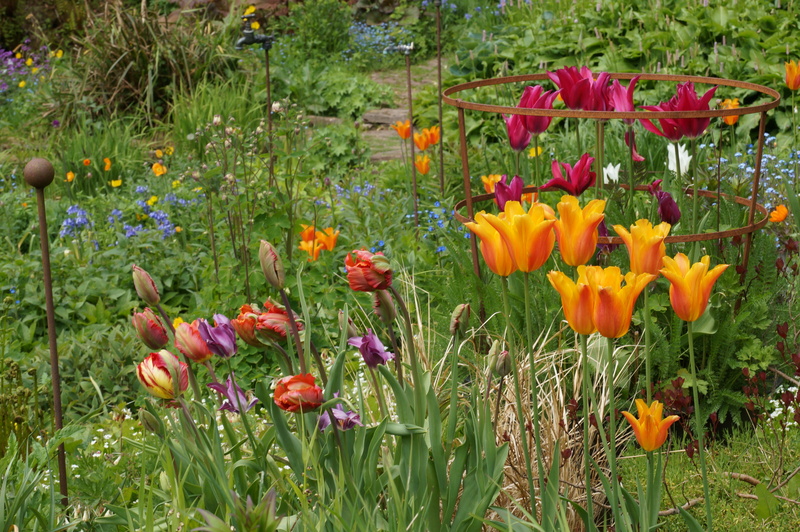 Tulips planted among the dead seed heads of achiliea and self-seeded molinia in a heavy ‘copper’.Looking so ‘structural’ that I couldn’t bring myself to take them out. Mexican daisy and ox-eye daisy with mallow which will be supplemented with hare’s tail grasses (in pots in the cold frame over winter) in the Spring. Lily Lady Alice in this copper too. With lots of tulips. Not much to look at now but the plants will put down good roots over the winter and when the tulips have flowered, we just remove them.